Do you provide software for ACA reporting purposes? Yes, our software generates the company 1094-C and the 1095-Cs (for employees and the IRS, and also handles self-insured companies). We have an electronic filing option if you have 250 or more employees (or just prefer electronic vs paper filing). The e-filing version generates all the test files required for your Transmitter Control Code (TCC) approval, though we also offer an a la carte service to submit the files on your behalf if you would rather not deal with the IRS’s lengthy application process. How does the software work? Is it something I would manage weekly with entering new hires/etc.? We have an easy and intuitive interface which mirrors the IRS 1095-C form, and the software has embedded help documentation if you get stuck. Personal support time may be purchased as well. You can enter/import data on whatever timetable works best for you and your business, though there is no need to update your data more frequently than once a month. If you choose to import your employee hours, the software produces measurement period reports (the “Look Back Method”) to help you identify which employees are full-time. Would I print the end of year tax forms with the software? Yes, the software seamlessly prints employee copies of the 1095-C to the required pre-printed forms and either paper or electronic versions for the IRS. The initial cost of our software (including the electronic filing option) varies by company size, and there is a nominal yearly fee cover updates. It is important to note that our software is affordable based on the features provided, and data is much easier to upload compared with many other systems. 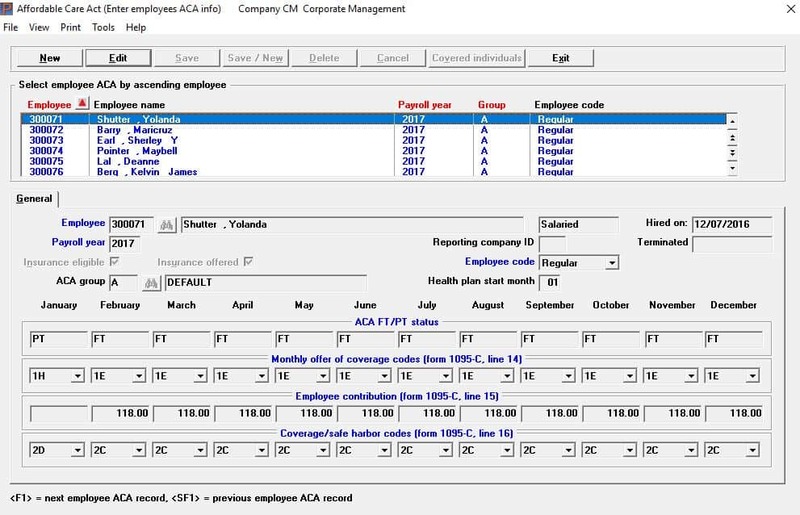 Learn more abuot our ACA Reporting Software. Or Contact Us – We are here to help.